Let me just say, I am NOT a morning person. Because of that, breakfast tends to get a bit run-of-the-mill, more-of-the-same-ish. This is very unusual for us – I hate cooking the same thing, so it’s usually always something new for dinner. But breakfast is another story, and of a morning I absolutely do tend to rotate a few dishes in my early morning coma: my Raw Superfood Chia Seed Porridge (my favourite breakfast), CADA with yoghurt (Tyler’s favourite breakfast), standard porridge, or scrambled eggs with sauteed mushies and spinach. Usually with a juice or smoothie of some description. Very, very, very occasionally I will do pancakes. But that’s about where the breakfast adventures stop. So obviously, I am in dire need of a kick up the bum in the mornings, and some more breakfast ideas. Especially winter breakfasts, because sometimes it is just too cold for CADA or chia porridge! I don’t know exactly when this idea came to me, but boy was I excited when it did! A winter-suitable way of serving CADA, sprinkled on top of a delicious bed of stewed rhubarb. It was so yummy, we all just about licked our bowls clean! 1) Weigh almonds and coconut into TM bowl. Quarter the apple and remove the seeds, then add to TM bowl. Set the dial to closed lid position and hit turbo 3 or 4 times until finely chopped. Set aside. 2) Without rinsing the bowl, weigh in the dates. Set dial to closed lid position and turbo 6-8 times until finely chopped. 3) Add rhubarb, raspberries (if using), and lime juice. Cook for 10 minutes at 100 degrees, on reverse and speed soft. 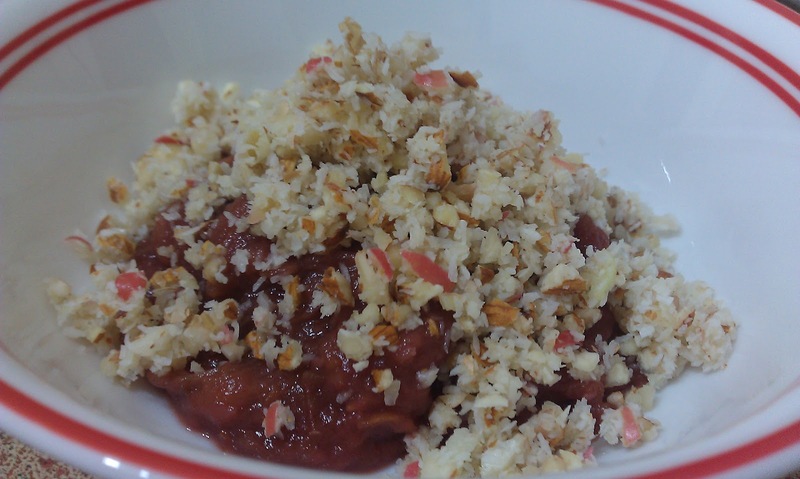 4) Serve a heaping dollop of the stewed rhubarb covered in the turbo’d almond, coconut and apple mix. « Marshmallows – Naturally Sweetened and Grain Free!